This tour of Vietnam & Cambodia takes place over 17 days and features a great many highlights and lesser-known locations in between Hanoi and Siem Reap, prior to culminating in one night in Bangkok. 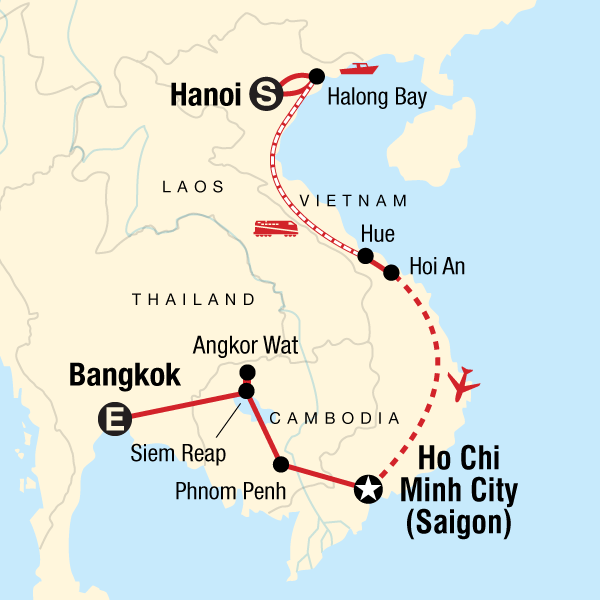 Travelling by overnight sleeper train, local buses and an efficient internal flight, from Hoi An to Ho Chi Minh City, allows travellers to do exactly that with featured activities, including cycling, hiking and a river cruise along the Mekong, adding to the essence of exploring in Southeast Asia. As part of a small group you’ll find plenty of opportunities to make new friends as well as meet local people, with guided tours of Hue, Ho Chi Minh and Angkor Wat helping you piece together the historical threads that have helped to shape Vietnam & Cambodia into what you’ll find today. Free time, optional excursions and included group activities all add up to a really well-rounded and varied tour with everything from junk boats on Halong Bay to traditional Khmer cuisine in Siem Reap, enabling travellers to experience Southeast Asia at a relaxed and immersive pace. Other optional unique experiences on this trip that allow you to support the local economy and learn about Cambodian and Vietnamese culture include: A boat tour up on Tonle Sap lake in Cambodia to see how local people live on the lake either on floating houses or on houses on stilts, boat trip in Shianoukeville, boat trip on Mekong and motor bike tour in Chau Doc, bike ride in the country side of Hoi An exploring the Vietnamese life outside the city, having lunch in a local family’s home. Or why not do a photo tour either in the morning or afternoon and get close to the locals and learn more about using your camera. Amazing day on a motorbike exploring both Hue city and the country side around. Get up early in the morning in Hanoi, Ho Chi Minh City or Phnom Penh and see the locals doing exercise, and if you like join in. This company has operated on responsible tourism values since its inception. From an environmental perspective, our initiatives extend from our company offices to our tours. Our head office and stores are powered by a local green energy provider, we encourage cleaner transportation methods for staff, and purchase all supplies from a local green business supplier. Our office is as paperless as possible and our brochures use 100% FSC certified sustainable paper. Getting Dirty for Earth Day: Every year we hold clean-ups in our office locations around the world. This year we worked with a local community centre on their community gardening efforts by planting flowers, trees, and prepping plots for vegetable planting. Our style of trip, travelling, eating and staying with the locals, puts you right at the heart of the culture in Laos, Vietnam and Cambodia. In Siem Reap on day two we will have an included local meal either at New Hope Cambodia (Planeterra project) or in a small village outside Siem Reap. In Vietnam we will enjoy some of the local food, sitting on small plastic chairs on the side of the street or café da, Vietnamese ice coffee or if you like join in with the locals drinking Bia Hoi (cheap fresh beer also served on the street or in small local shops). Chatting with the locals will give you an amazing insight in local life. It may not be apparent that learning about and respecting other cultures is part of being a responsible traveler, but we believe that this discovery is a natural way for people of all backgrounds, nationalities, and religions to interact and learn from each other, fostering peace and understanding. And it’s just plain fascinating!